The Calgary Flames are going to the playoffs. With a 5-2 Friday night win over the San Jose Sharks, the Flames will join the Edmonton Oilers in the post-season. Calgary also moved a point behind the Sharks for third in the Pacific Division. They’re three points ahead of the Nashville Predators, although Music City has a game in hand. This is a pretty big deal for the Flames, who started the season with a 5-10-1 run and missed the playoffs last season. Calgary is now 44-30-4 and will join the Oilers and Montreal Canadiens as Canadian teams in the post-season. The Ottawa Senators and Toronto Maple Leafs are still on the bubble and haven’t clinched yet. It’s a far cry from last season, when no Canadian teams made the playoffs. While the youth movement in Edmonton has been well-publicized, the Flames have undergone a similar transformation. They began drafting prospects like Sean Monahan and Sam Bennett after years of low finishes and those selections are now paying dividends, with Calgary able to ride young guns like Michael Tkachuk and Johnny Gaudreau to the promised land. They may not be as young as the Oilers overall, but the Flames are certainly trending in the right direction and have a sublime mix of experience and vigour. Gaudreau, drafted in the fourth round of the 2011 NHL Entry Draft, is the team’s leading scorer with 60 points in 68 games. Monahan is second with 58 points in 78 games, while Mikael Backlund is third with 50 points in 78 games. 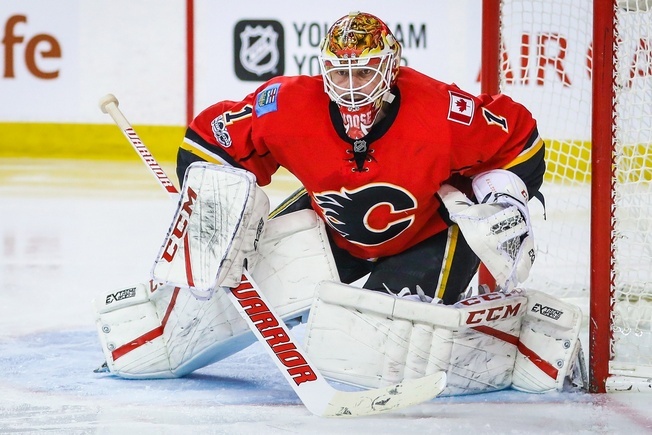 The Flames have also received quality goaltending from Brian Elliott. The 31-year-old is 26-15-3, with a 2.50 goals against average and a .912 save percentage. That’s down a tick from his career average, but he’s made improvements as of late to his overall game and seems to have found his groove. “He’s been our MVP throughout this whole run,” Flames captain Mark Giordano said. So, with goaltending peaking at the right time and the young guns scoring, could Calgary make a considerable run in the post-season? Absolutely. The Flames may have a greater roster than many give them credit for, plus they seem prepared to thread the needle between youth and experience. That could prove troublesome for the opposition and could prove downright awesome for those seeking a real Battle of Alberta at long last. Next What’s Next for the Los Angeles Kings?